An imposing and controversial figure in his all-too-brief career at Carlton, Albert ‘Bert’ Boromeo was only eight days short of his 27th birthday when he played his first match for the Blues in 1919. For reasons unexplained, he took to the field that day at Princes Park in a pair of street boots, but; "he gave decided promise, and looked every inch the footballer", according to former Carlton coach Jack Worrall, who was reporting on the match for The Argus newspaper. Born in the tiny township of Timor in central Victoria in 1892, Boromeo became a star follower-forward for nearby Maryborough before agreeing to have a crack at VFL football with the Blues. A natural athlete who stood 184 cm and tipped the scales at 89 kg, he was a vice-like mark and a thumping kick, and his bulk and strength made him near-impossible to dislodge in any contest. Reflecting on his career, a local newspaper reported; "Speck, as he was always called in Maryborough, was always credited with the mark - whether he got it or not." Boromeo played finals football in four of his five seasons at Princes Park, first as a follower, and later as a dangerous partner to Carlton’s champion centre half-forward Horrie Clover in attack. 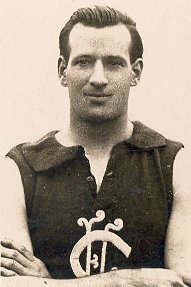 He was a reliable big-occasion player and was chosen to represent the VFL in interstate matches each year from 1920 to 1922. But his finest moment came in the 1921 Grand Final against Richmond, when he was a unanimous choice as Best on Ground for the vanquished Blues. Continuing a disappointing sequence of finals losses, Carlton fell to Essendon by five points in the 1922 Semi-Final, then went into decline the following year and dropped right out of contention. In August 1923, Carlton played Essendon again in round nine at Windy Hill. The Blues turned in a shocker to be thrashed by 11 goals, and that result triggered a sensational series of incidents that ended Boromeo’s career at Carlton. In the rooms afterward, amid veiled references to players being got at or bribed, two senior Blues; George Bolt and Jack Morrissey, engaged in a fist fight that eventually involved a trainer and a member of the club committee. Meanwhile, Boromeo was heard to heavily criticise his captain-coach Clover. When the dust eventually settled, all those involved were summonsed to appear before the match committee to explain their actions. The main participants in the fight were immediately suspended, as was Boromeo, who was accused of ‘creating dissension in the club.’ Interestingly, it is said that when the rest of the team were informed of the committee’s decision, they supported it unanimously. In the wake of his suspension, Boromeo resigned as a Carlton player, and announced that he was going to Richmond – but Carlton wouldn’t release him to strengthen the team that had become the Blues’ nemesis. A standoff ensued until 1926, when the Blues finally relented, and released the 34 year-old from any further obligations at Princes Park. Boromeo turned out for Richmond in 14 games in 1926. He booted eight goals, and was serviceable rather than dominant. After that one swan-song season, he ‘went bush’ again, and played on into his forties at a couple of country clubs, including Horsham in Victoria’s western district, where he was the publican of the Victoria Hotel. Bert wrote an article on Ruck Play, Practice, Diet, etc. for the Melbourne Herald. It was reproduced in the Daily Herald Adelaide April 23 1923. In an article on Maryborough football on April 12, 1930, The Argus (in part) said; "Boromeo was a magnificent high mark, an expectionally fine drop kick, and was a prime factor in Carlton's successes a few years ago. He was a match winner on his day, though just a trifle lacking in dash." Contributors to this page: blueycarlton , PatsFitztrick , Bombasheldon , molsey , tmd1 , p(12)terg , keogh , Jarusa , true_blue24 , nikki and admin . Page last modified on Sunday 21 of July, 2013 08:43:12 AEST by blueycarlton. 2001 Rd 18 - Matty Lappin on fire. Michael Young sew on badge.